Avram Noam Chomsky (janam 7 December 1928) ek American linguist, philosopher, political activist, author, aur lecturer hae. Uu Massachusetts Institute of Technology ke Institute Professor aur professor emeritus of linguistics hae. Barsky, Robert F. (1997). Noam Chomsky: A Life of Dissent. Massachusetts: MIT Press. ISBN 978-1550222821. http://cognet.mit.edu/library/books/chomsky/chomsky/welcome.html. Noam Chomsky on NATO's Kosovo Campaign (Danilo Mandic, RTS). Noam Chomsky A resource from Tidsskriftcentret.dk in English & Scandinavian. The Chomsky Viewer Video compilation of Chomsky with other activists in PowerPoint format. 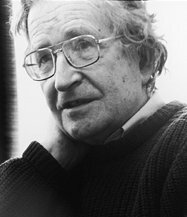 OneBigTorrent.org (originally called "Chomskytorrents") begun with (and still has) lots of links to Chomsky-related media.